Through stem cell techniques, a group of scientists led by Dr. Anita Bhattacharyya generated neurons from Down's syndrome patients' skin samples, providing an unprecedented model of early brain development in Down's syndrome. 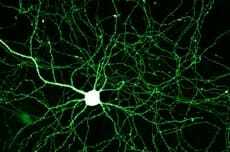 The neurons formed fewer connections early-on than those without the disorder. This difference, according to the researchers, is critical and could help explain features of Down's syndrome. When examining genes, they found certain age-related genes to be more active in the Down's syndrome neurons than those of unaffected participants. Taken together, these findings using Down's syndrome cell models provide initial key findings that may yield therapies.